First an apple cake and now a butternut squash soup. That’s it. It’s totally fall. It’s starting to get chilly, and I feel like I really should stop wearing my flip flops. Lately, I’ve been stockpiling tomatoes like they’re going out of style; we’ve been eating them thinly sliced, with salt and pepper, a squeeze of lime, and a drizzle of olive oil (basil and mozzarella, optional). Slowly, the tomatoes are being inched out by the winter squashes, and the root vegetables and the onions (so many varieties! ), and I dread the day when they will be completely gone, and it’ll be soups, soups, soups. Though if this soup is any indication, it can get pretty exciting. This soup is in honor of a very special little person (aka “the dude”), who was born just a few days ago. His mother is one of my childhood best friends, and someone whose love for soup closely rivals my love for chocolate. We have always been there for each other’s major milestones, and this is the first time an ocean separates us. She was there during my teenage years, a period which was difficult and dark at times, and always full of drama. We traveled to Paris, New York and Sinai together. Though perhaps, Sinai, which was closest to home, was the most memorable. We were there for six days, and spent half of the time hiking (for her) and half of the time at a beachside cabana (for me). Luckily for us, we started with the hiking, so I had three days to cool off, and frame the trip as a “positive” memory. She was the last friend at my wedding, and one of the first to comment on this blog. So T., this one’s for you. Welcome, little dude. I can’t wait to meet you. This soup is everything a soup should be- easy to make, and super comforting to eat. The spices inject a nice kick of heat, creating a soup that is rich and complex, with just the right amount of intrigue to grab your attention. I made slight substitutions for some of the spices which I didn’t have on hand, and have placed those in parentheses. 1. Melt butter in a large pot over medium heat. Add onion, and cook, stirring occasionally, until it begins to soften, about 4 minutes. Add squash, and cook, stirring occasionally, until soft, about 10 minutes. 2. 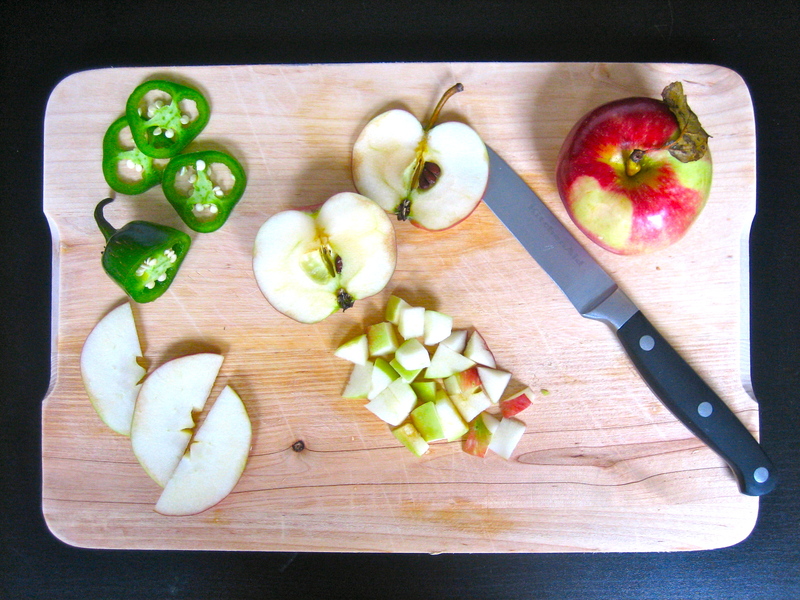 Add apples, spices, stock and the water (just enough to cover). Bring to a boil. Reduce to a simmer, and cook until vegetables are tender when pierced with a fork, about 30 minutes. 3. Puree in batches in a food processor or blender until smooth, and return to pot. (Or use a stick blender, if you have one, and puree directly in the pot). Heat over low, thinning with more water if necessary. 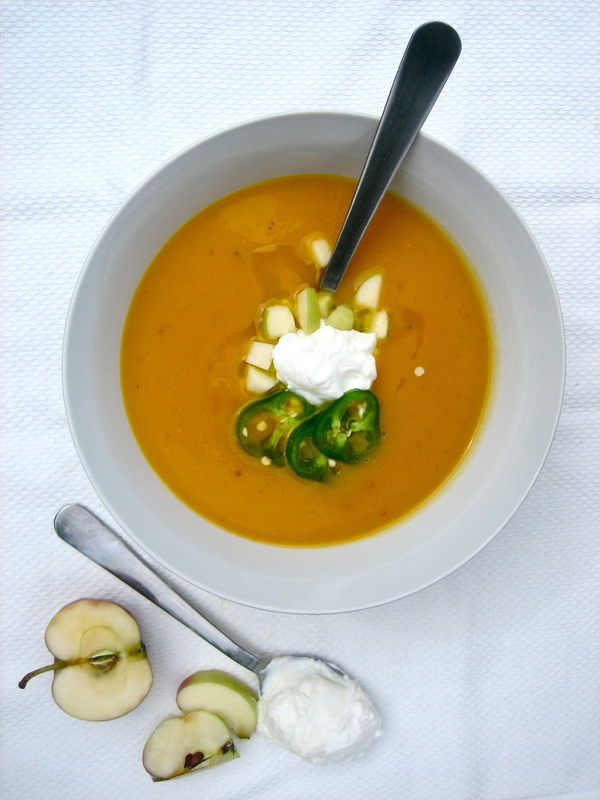 To serve, ladle the soup into bowls, and garnish with diced apples, jalapeno slices and dollops of sour cream or yogurt, if desired. And the soup looks great. I’ll def try it when the first rain comes to LA. 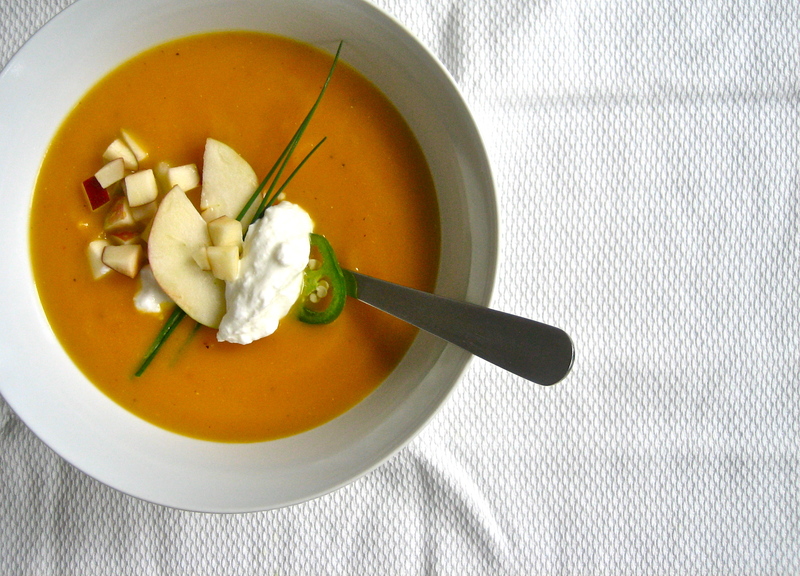 That sounds like a great idea, adding aplles to a butternut squash soup, yum. It’s the perfect meal for a chilly autumn day. Hi Lemon! Hope you try the soup- we loved it! I’m glad to have this recipe. I sometimes avoid making this kind of soup because it’s sometimes bland. I really like the addition of the jalapeno and the spices. Your presentation is great! Great post! I am sure this soup will share so much warmth in this starting-to-get-chilly-weather…By the way, the writing felt like a warm hug to the heart too. Thanks!